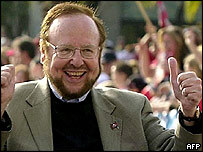 US tycoon Malcolm Glazer has announced that he now owns 97.3% of shares in Manchester United, but is still short of gaining complete control. Mr Glazer has also extended the deadline for shareholders to sell remaining shares to him for £3 each. He had said he would extend his offer if he did not get 97.6% of shares - the point at which he can forcibly buy the remaining stock - by Monday, 13 June. Shareholders now have until 1500 BST on 27 June to decide whether to sell. In London on Tuesday morning Manchester United shares were being traded at 309 pence. They have since fallen to 298 pence, the same price as at Monday's close. Mr Glazer plans to eventually delist the club's shares from the London Stock Market. Most of the remaining shares are believed to be in the hands of loyal Manchester United fans who have promised to fight the US tycoon to the end. The Glazers need to get their hands on a total of 258,110,791 shares to force remaining shareholders to sell to them, and are currently short by 204,504 shares. How are football shares faring? Pressure group Shareholders United (SU) has been threatening to "make life difficult" for the Glazers. "It is a very sad day for Manchester United supporters," SU's Sean Bones told BBC News on Tuesday. "We are going to continue to work as hard as we can to accelerate the return of ownership from the Glazers." Supporters are worried at the amount of borrowing involved in the deal. Malcolm Glazer plans to increase Man United's revenues by lifting ticket prices by more than 50% over four years, fuelling further outrage from fans. He has pledged to generate more cash from sponsorship deals and to cap player transfer spending at £25m a year. The Glazers' first offer to buy out the remaining minority shareholders closed at 1500 BST on Monday. In a statement to the London Stock Exchange on Tuesday, Mr Glazer said his bid vehicle Red Football now owned 257,906,287 of Man United's shares. Red Football said shareholders who wish to accept the offer should return shares "as soon as possible and, in any event, by no later than 1500 on 27 June". The US billionaire, who owns NFL franchise Tampa Bay Buccaneers, became majority shareholder of the club on 16 May in a £790m takeover. Red Football hopes to take the club off the stock market by 22 June, after 14 years of the club being listed in London.